These days it`s not so easy for Jews living in a European Union country, particularly when it happens to be the homeland of the BBC. Everyone knows our EU taxes are used, at least in part, to fund Palestinian terror and Jihadist indoctrination in Hamas-run schools and medrassas. Everyone knows the BBC is grossly biased against Israel but we have to pay for that, too. Just as we are powerless to dictate where our EU taxes go, we cannot escape paying a statutory license fee that keeps the BBC in business. Here in Britain it is unlawful to watch TV -- any channel -- unless you have paid that license fee to the BBC. They even have detector vans roaming the streets, topped with parabolic dishes and antennae. The BBC`s answer to AWACS, these units are able to ferret out any poor pensioner freeloading on soap operas on the fifth floor of a council estate and impose a heavy fine. to deter and punish those responsible. As for Belgian Jews, in addition to their own EU taxes, they also have to fund the prosecution of Ariel Sharon as a war criminal. 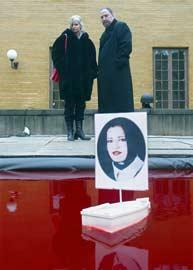 staged an exhibit featuring an image of the notorious Haifa suicide bomber floating in the center of a large pool of blood-colored water. The visiting Israeli ambassador flew into a rage when confronted with this scene and did his best to vandalize it before being escorted from the premises. He later called the exhibit a monstrosity and an affront to the grieving families and victims of the Haifa bombing. To make things worse, the exhibit turned out to be the work of an Israeli expatriate by the name of Dror Filer and his Swedish wife. For me, the Stockholm incident plumbed a new low for Israel and European Jewry and our hopes of ever getting a fair hearing or a fair shake of the burgeoning political correctness which seems to benefit all minorities except the Jews. We all ask ourselves the same kind of questions. Can you imagine any country putting on such an exhibit that glorified attacks on Arabs? How is it possible that serious journalists and politicians can so successfully peddle a moral equivalence between the bombing of a restaurant filled with women and children and the targeted killing of armed terrorist leaders? Why does the enlightened world hate the Middle East`s only democracy while doling out sympathy and limitless funds to the inventors of airline hijacking and suicide bombing? This is plain madness. However, the Stockholm incident has changed my view. Either by way of word association or pure chance, I found myself thinking about the phenomenon known as Stockholm Syndrome. Thirty years ago, on August 23, 1973, three women and man were taken hostage in an armed raid on one of the largest banks in Stockholm. They were held for six days by two ex-convicts who threatened their lives and occasionally put nooses around their necks. After a few days, police negotiators were astonished to find the hostages siding with their captors and actively frustrating efforts to free them. The hostages had formed a bond with their captors which persisted long after they had been freed. Amazingly, one of the women later became engaged to her former captor while he was in prison. best-known case histories is that of Patty Hearst, who, after being kidnapped in the mid 70`s by the Symbionese Liberation Army, ultimately took that group’s side and willingly participated in its bank robbing exploits. This makes me conclude that much of the EU must be suffering from a bad case of Stockholm. captive to terror for three decades. Iraq. The Germans have a similar insurance policy. Isn`t this behavior exactly Stockholm Syndrome on a national scale? Beyond keeping their cars gassed up and way above the undercurrent of anti-Semitism, isn`t it all about self-preservation? About keeping the bombers out of our own back yard? No wonder a recent EU survey found that most Europeans considered Israel the biggest threat to peace. This is akin to the Stockholm bank hostages, with nooses around their necks, shouting that the police were the biggest threat to their lives.